Prolific and easy to grow ... the heirloom Tomato Tigerella. Eating a home-grown heirloom tomato is one of life's simple pleasures. Sun-ripened and perhaps a little odd-looking, the humble heirloom tomato has one big win over commercial varieties, and that's their flavour. Nabil Ahmad is a research fellow in horticulture at the University of Sydney. He says there are three main factors that create the flavour differences between commercial and heirloom tomato varieties. “The first factor is genetics, and it's the most important factor,” says Dr Ahmad, who has 20 years' experience in crops, with particular interest in tomato plant breeding. Dr Ahmad says the components that create the flavour of the tomato are extremely sensitive, so any changes to the genetic make-up of the plant through breeding will ultimately impact on the taste of the fruit. “We miss out on flavour because it is controlled not just by one gene but by many,” says Dr Ahmad, who says the biggest change in flavour occurred with the discovery of the "(u/u)" gene – or uniform ripening gene – around 70 years ago, which has now been incorporated into most commercial varieties of tomato. The sensitive characteristics of flavour are also highly affected by growing conditions, says Dr Ahmad. Things like soil, fertilisers, lighting and heat all have an impact on tomato flavour. The third factor that affects tomato flavour is agricultural practices, says Dr Ahmad. Borja Valls, an agricultural engineer and farmer, agrees that the time you pick the fruit is crucial to flavour. “The moment you pick the fruit is very important. Fruit for the supermarket needs time for transporting, so it's picked green,” says Valls, who uses a community-supported agriculture model of farming with his company Common2Us. Valls' one-and-a-half-year-old business delivers produce straight to the customer from the farm. By cutting out the middle man and only delivering locally, he says they can afford to do things differently from larger companies. Tim Sansom, CEO of horticulture and operations at the Diggers Club, says interest in heirloom varieties has been on the rise since the company first started selling them around 20 years ago. “We've definitely seen an increase in interest in the last few years,” says Sansom, who has been working at the Diggers Club for a decade. - The tomato that won the Diggers Club taste test in 1993 and came second last year, the Tommy Toe, is a great tomato not just for flavour but also for yield. Tommy Toe vines produce cherry tomatoes continuously for four months. 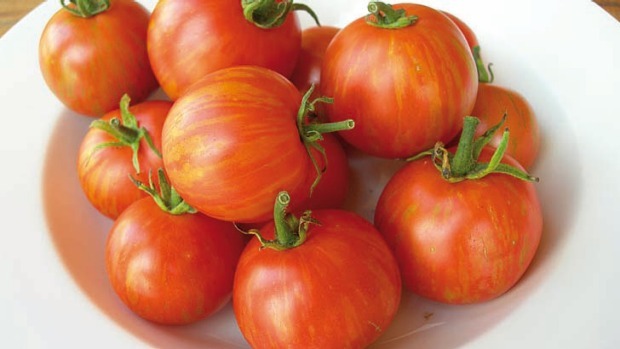 - Another great small tomato variety is the Tigerella. The red-and-yellow-striped fruit is slightly bigger than a normal cherry tomato, and the plants can produce up to 20 kilograms of fruit in a season. - For bigger tomatoes, the Ananas Noir and the Granny Throwing (or Periforme) scored seventh and ninth places respectively in last year's Diggers taste test, and are also beautiful to look at. - The Rainbow Beefsteak and the Big Rainbow varieties offer lots of colour and flavour, and produce very big fruit.